With any marketing activity, it’s important you measure the results. SEO campaigns are no exception. Unless you know how effective your campaign really is, you cannot measure its value. That’s why your SEO analytics are so important. Here at SEO Service Pros, we stress the importance of conversion rates and increased sales. Having a well-performing website is not enough. It must deliver a measurable ROI (return on investment). We recommend Google Analytics for our clients’ SEO campaigns. Is your SEO campaign delivering a good ROI? Are you able to measure its effectiveness? If not, we can help. You can send us your enquiry or give us a call on 0845 601 2237. We’ll be happy to explain a bit more about analytics and SEO. 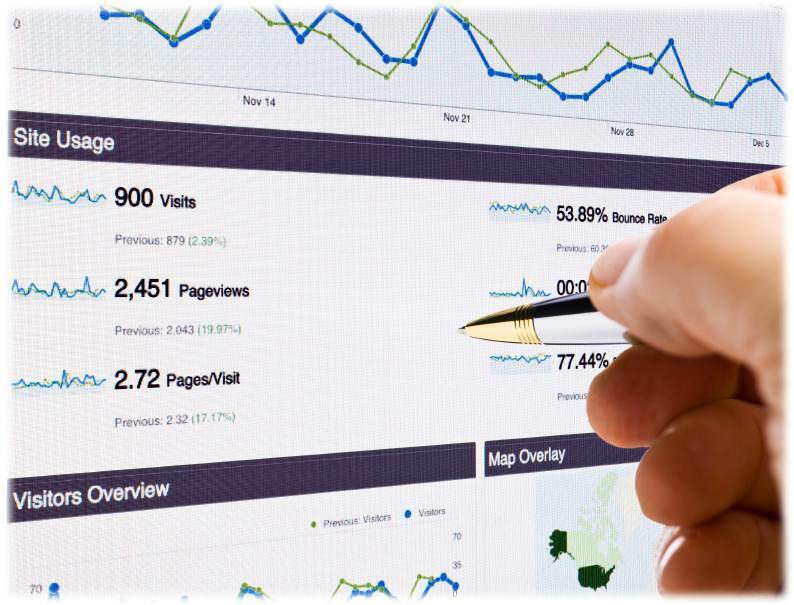 SEO analytics provides you with a wealth of intelligence on the performance of your website. It helps measure the effectiveness of your search engine optimisation campaign. There are many analytics tools available. The best known and most widely used for SEO is Google Analytics. What does Google’s SEO analytics tool measure? The geographic location of your website visitors – critical if you are running a multi-lingual or local SEO campaign. The bounce rate – if large numbers of visitors are bouncing straight out of your website, it’s important to investigate and find out why. The length of visit – the average website visit is just a few seconds. Our objective is to make your site so interesting and appealing, visitors stay longer and convert into customers. Most popular pages – if some pages are getting more hits than others, it’s important to understand why. This knowledge helps improve the other less-popular pages. Entry pages – this helps understand which pages are optimising better than others. You can use this information to improve under-performing pages. Exit pages – if your visitors regularly exit your site from the same page, it can indicate a problem. Having this intelligence means it can be identified and resolved. Keyword data – this helps identify which keywords are the most effective and which need refining. Visitor paths – SEO analytics help you see how visitors navigate your site and determine the ease of navigation. Search engine intelligence – this tells you which search engines are driving the most traffic to your site. Referring sites – your SEO analytics show traffic coming from other websites. This helps measure the effectiveness of your article submission and directory submission campaigns. This might all sound very complicated, but that’s what we’re here for at SEO Service Pros. Each month, you’ll receive a comprehensive SEO analytics report and we’ll work with you to make sure you understand how you can benefit from this valuable marketing intelligence. If SEO analytics leaves you bewildered, don’t give up. Give us a call here at SEO Service Pros on 0845 601 2237. If you prefer, you can send us an enquiry. Remember, we’re here to help with all your SEO analytics enquiries.